Home » Reference Section » Where Do Retirees See Themselves Living? 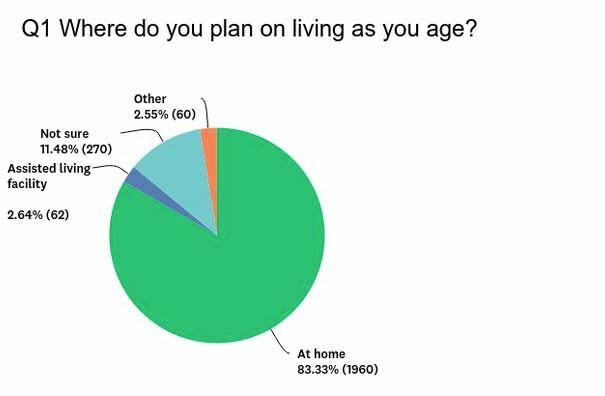 RetirementLiving.com recently published a study on where retirees see themselves living, whether aging in place at home or transitioning to an assisted living facility. While 75 percent of people said failing health would push them to move into an assisted living facility, most people plan on aging in place for as long as possible. Making home modifications and using modern technology are the leading ways people plan on living at home longer. Here’s the link to the full study. People are starting to think about and/or plan on using technology more to help them age in place. 53 percent of people say they are likely or very likely to use online pharmacies, while 40 percent say they are likely or very likely to use things like medical alert systems, ride-share apps (Uber, Lyft) and grocery/food delivery services (Peapod, UberEATS, etc.) These numbers are up from 10 years ago where about 33 percent of people said they would “possibly” use transportation services and around 31 percent of people said they would not use meal delivery services. When asked if they could no longer live on their own, 52 percent of people said they would rather live at home but with a part or full-time caregiver over moving into an assisted living facility, moving in with friends or family or moving into a nursing home. Just over 30 percent said they would move into an assisted living facility, up 13 percent from 2016.